I can’t even begin to tell you how excited I am to share this recipe with you. I love breakfast and I especially love going out for breakfast. One of my favorite things to order is eggs Benedict. 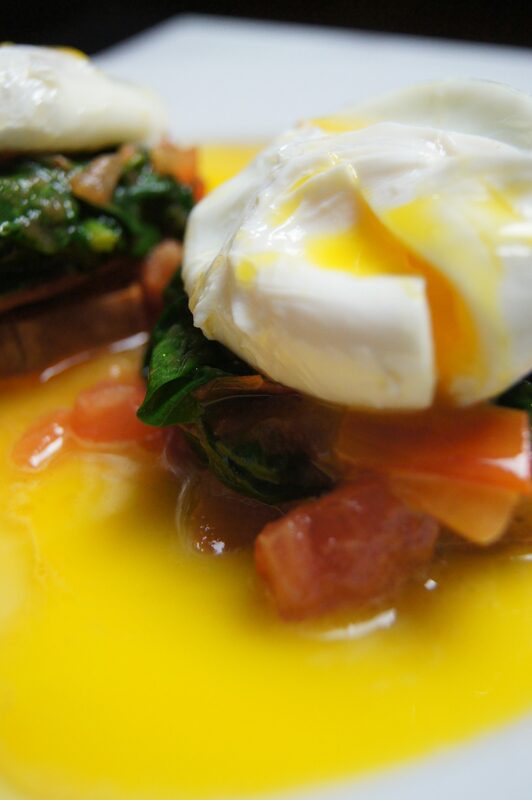 It’s layers of some of what makes life worth living: poached eggs, with beautifully runny yolks; nicely grilled English muffins; and rich, creamy hollandaise sauce. And let’s not forget the Canadian bacon or strips of bacon that’s added to it. It’s a party of ooey-gooey goodness. And it’s a party that, if I go to often enough, will leave me looking like the Michelin Tire Man or Stay Puft Marshmallow Man. Though both equally cute, I don’t want to have to count buttoning my jeans as an Olympic sport. The last time I was out having traditional eggs Benedict, I was so happy, but then started feeling a little guilty. Especially when I was sliding my homefries in the hollandaise sauce. I was thinking that there has to be a healthier alternative that still tastes just as good. And that’s what I came up with here. 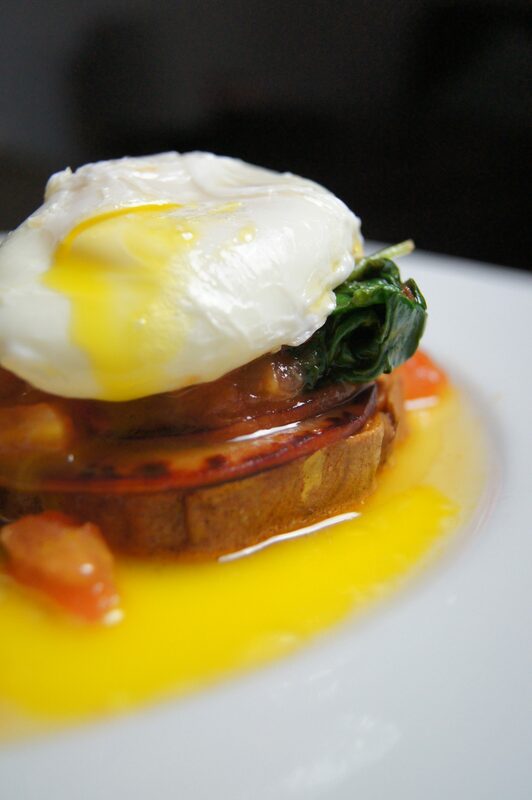 I love just about every variation of eggs Benedict, and Florentine is in my top 10 of different ways to have it. Oh, who am I kidding? Every variation is my favorite. Usually, Florentine is just spinach, but it looked a little lonely and needed a friend. So I thought adding tomatoes would be good and add to the color. They both work great here with the sweet potato. And seriously, look at how pretty it looks! I had some trial and error with a healthier version of hollandaise sauce. For the most part it was error. So I decided to turn to one of my favorite bloggers, Danielle Walker, who’s behind the blog Against All Grain. 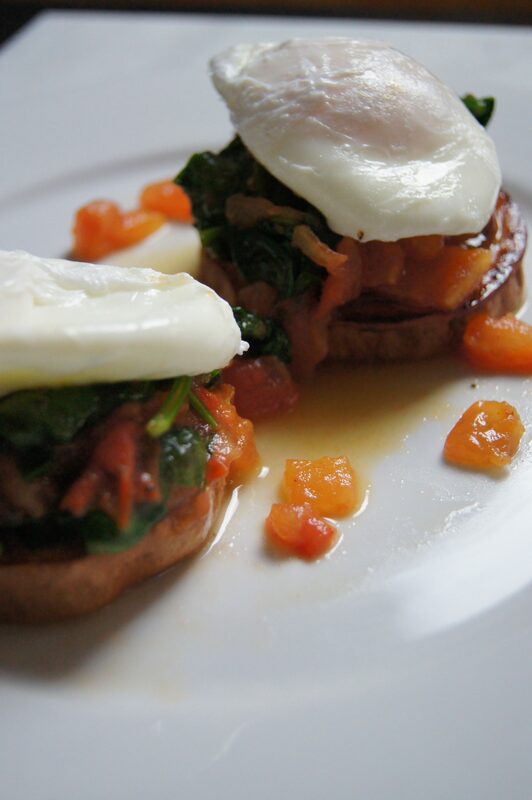 Her Paleo Coconut Oil Hollandaise Sauce is delicious and I would use it, not only for these Paleo Florentine Eggs Benedict, but for grilled asparagus or salmon, as she suggests in her recipe. Mine didn’t come out as thick as Danielle Walker’s recipe, but the flavor was amazing. My blender was too high on the counter for me to pour the coconut oil in so I had to stand on something for extra height. You didn’t really need to know that, but I just wanted to share the struggles I face with being only five feet tall. Some would argue that I am 4’11 and ¾” and to them I would say, “Whatevs.” Yeah, you know who you are. 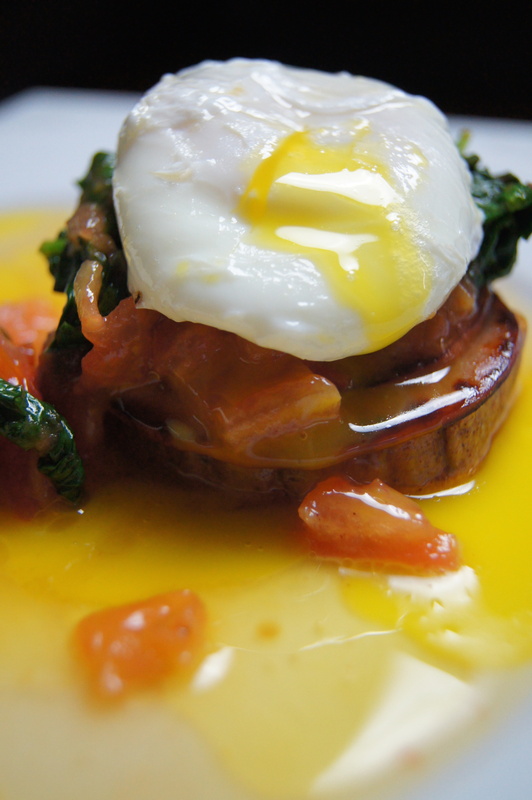 See, these Paleo Florentine Eggs Benedict are so good that they’ve made me deliriously happy. And that’s exactly how I was when I taste-tested these. Everything came together so beautifully, I wanted to hug someone. And you will too when you make these. If no one is around to hug, you can virtually hug me. For the Sweet Potatoes: Preheat oven to 400° F. Line a baking sheet with non-stick aluminum foil. Place sweet potato rounds on sheet and sprinkle with salt and garlic powder. Drizzle 1 teaspoon oil over the potatoes and toss. Place sweet potatoes flat on the sheet and bake for 20 minutes, turning over half way through. For the Spinach and Tomatoes: Heat a pan over medium heat with remaining teaspoon oil and add the tomatoes and spinach. Season with salt and pepper and sauté until spinach is slightly wilted. Keep warm. For the Hollandaise Sauce: Fill a blender with boiling water and cover with the lid. Let it sit for 10 minutes. Thoroughly dry the blender, then blend the egg yolks and lemon juice. With the blender on low, slowly pour in the hot coconut oil in a steady stream. Season with salt and paprika, then pulse a few times to combine. To Assemble: Place a piece of Canadian bacon or bacon strips, if using, on top of a sweet potato round. Spoon the spinach and tomato over it. 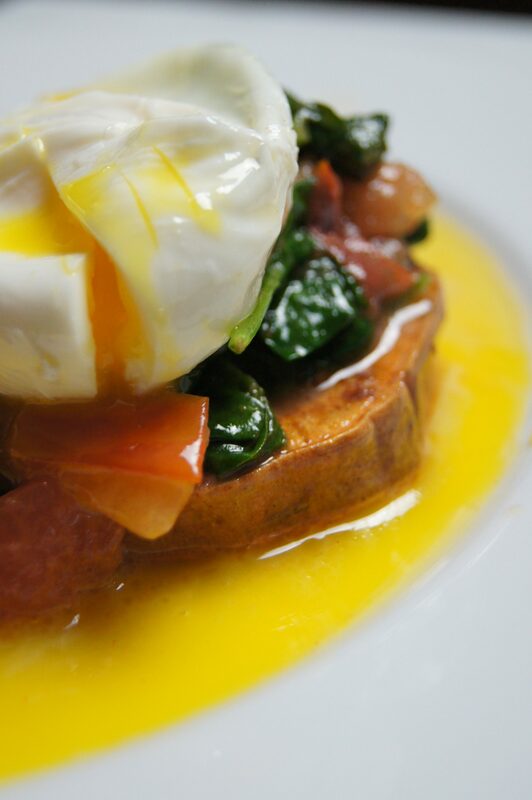 Top with a poached egg and drizzle with hollandaise sauce.